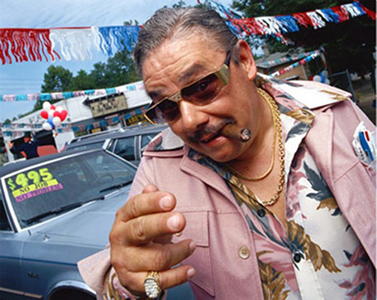 If you are an end-user, I am sure you’ve dealt with technology vendors that reminded you more of pushy used car salesmen than trusted advisors. They seem to only care about your concerns long enough to use them as a springboard for delivering their latest product pitches. And it doesn’t seem to matter if their latest products has any relevance to solving your problems. What – Our latest Cloud X platform has automated configuration management built-in and can scale to thousands of nodes in less than 5 minutes. How – We can help you create the next-generation Private Cloud within the walls of your datacenter. 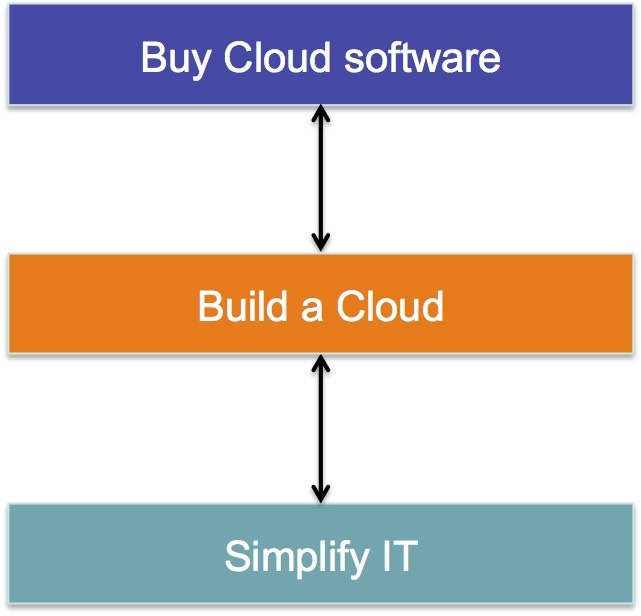 Why – A Private Cloud will help you simplify IT, save money, and it is what all the “cool kids” are doing. The problem with this approach is that it doesn’t actually take the time to address customer requirements, or more importantly aspire to help customer to meet their corporate goals and vision. In fact, it generally reinforces faulty strategic planning on the part of some customers who often implements products and tools based on tactical rather than strategic reasons. Why – The single purpose, cause or belief that serves as the unifying, driving and inspiring force for any organization or department. How – The guiding principles, strategies, or actions an organization or department takes to bring to life their Why. What – The tactics and results of actions taken to bring the Why to life. Though it is always an iterative process, my goal is to have customers answer these questions in that very specific order. 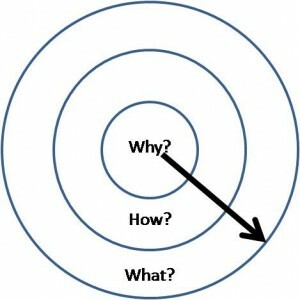 Some of you will recognize by now that my approach is modeled after Simon Sinek‘s The Golden Circle. Without attempting to do a deep dive on the topic, I would simply commend to everyone Sinek’s outstanding TED Talk. My specific interest in The Golden Circle is its application to IT Operations and how I can help customers to “Start with Why” as they inquire about trends like Cloud Computing and DevOps. A traditional media company decides there is money to be made by becoming an aggregator of social media content. This company decides that they need to be disruptive to not only traditional media but to current Internet media. Their plan is to create a new application for aggregating and distributing social media that can be tailored to individual users in real-time according to their interest and desires. This media company decides to charter their IT department with creating a special task force that would advise them how to go to market, in record time, with such an application, despite a track record of the company being late when it comes to innovation. And it must be done in such a way that the application can be rolled out and updated regularly without disruption. Why – What is the unifying cause and goal for the company and for IT? It’s not to merely create a next-gen social media aggregation software program. 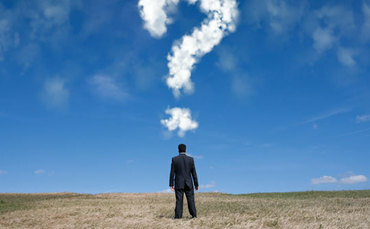 And it is certainly not implementing a Cloud because that is what all the new social media companies seem to be doing. 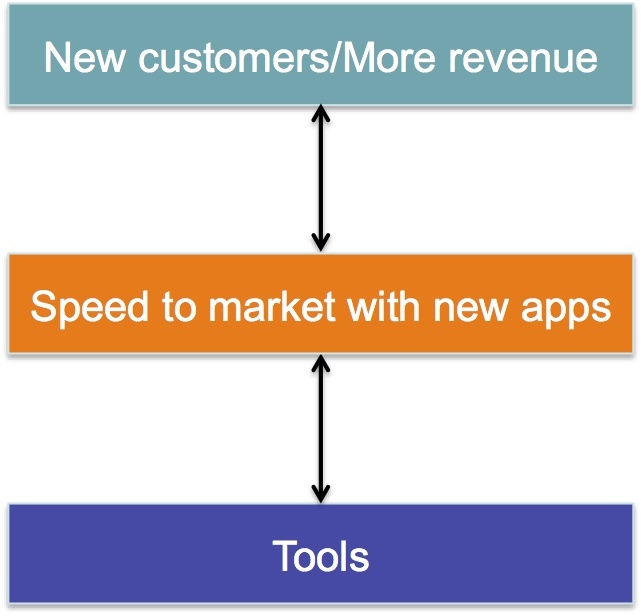 It has to go back to the idea that the company wants to be a disruptive force in the media industry by being faster and more relevant than their competitors so that can drive customer and revenue growth. How – What are the guiding principles and actions to bring bout the company goal? Again, many customers and vendors would want to jump in with discussions on tools and methodology but that would be mistake. Without an understanding of the strategies that must be taken, how can an IT organization know what tools and methodologies are most appropriate to accomplish the overarching goals? In this use case, the goal is to disrupt the media industry and it’s been determined by the Business that the way to achieve this is to come to market, in record time, with a new application. Therefore the actions that IT must take, as a service provider to the Business, is to adapt the culture of IT to make this a reality. Since speed of delivery in terms of rolling out the new application and updating it regularly without downtime is a requirement, Development and Operation must work in close concert with each other. IT resources must be available on demand and as much of the IT process needs to be automated as possible. The point is the products and tools should not be the starting points for how IT delivers value to the Business. In fact, I would assert that if vendors continue to lead with products and features, we do a disservice to our customers. At best, we setup IT for failure or limited success; at worst, we hold them back from innovating and providing the services their companies need to accomplish their purpose and cause.